Please copy and paste ' [[Category:Cichlids]] ' into the end of your article to include it in this category. Cichlids (pronounced “sick-lids”) are fishes from the family Cichlidae in the order Perciformes, with over 1500 known species. The family Cichlidae, a major family of perciform fish, is both large and diverse. Estimates of species range from 1300 to 1900, making it one of the three largest vertebrate families. They span a wide range of body sizes, from so-called dwarf species as small as 2.5cm (1") in length (e.g. Neolamprologus multifasciatus) to much larger species approaching over 100cm (39.4") in length (e.g. Boulengerochromis microlepis and Cichla ocellaris). As a group the cichlids exhibit a similarly wide diversity of body shapes, ranging from strongly laterally compressed species (such as Altolamprologus, Pterophyllum, and Symphysodon) through to species that are cylindrical and highly elongate (such as Teleogramma, Teleocichla, Crenicichla, and Gobiocichla). On the whole though, cichlids tend to be of medium size, round in shape and slightly laterally compressed, and generally very similar to the North American sunfishes in terms of morphology, behaviour, and ecology. 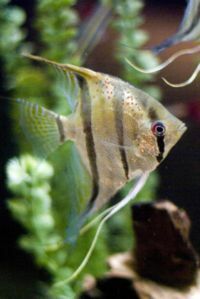 The most famous species of Cichlid is perhaps the freshwater Pterophyllum scalare or Angelfish. This page was last edited on 1 September 2015, at 14:33.